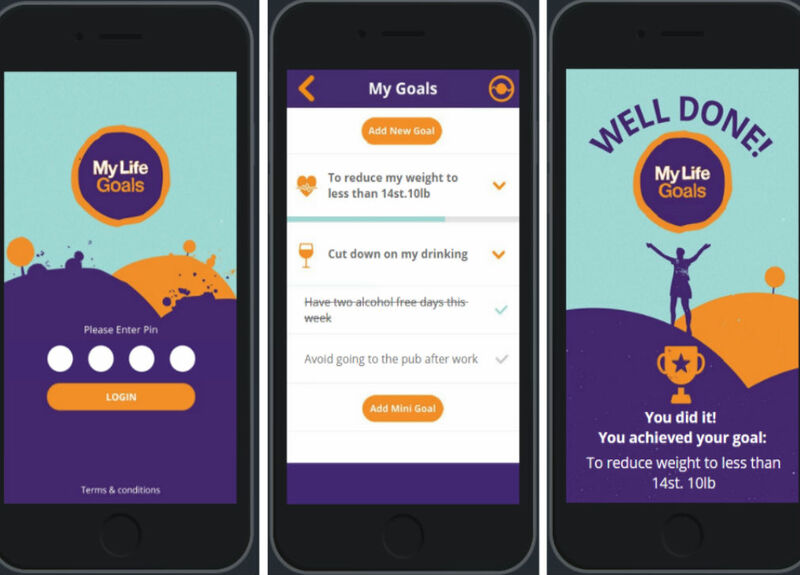 My Life Goals is a mobile app, developed by Big Life, to enable people using the app to take ownership of their goals, helping them to change their lives. My Life Goals is designed to be used by service users in any of our services where goals are set, and service users have a relationship with a coach, key worker, or similar individual. It is also designed for our staff and volunteers. Coaches use a web portal to view goals and send messages, based on a flexible access control model which is controlled by user consent. While there are many health apps on the open market, My Life Goals is different in a number of important ways. First, it is designed to be used in conjunction with a Big Life service, meaning that the user is supported in tracking and meeting their goals by an experienced and trained key worker. Second, rather than set defined goals, as many apps do (for instance 10,000 steps or a fixed number of calories eaten), My Life Goals allows the user to define what matters most to them, in any area of their life. We know that many users of Big Life’s services (and other similar services) come to us with complex and significant needs, so the ability to define your own goals, however big or small, is vital. Third, it provides rich information for staff. We are able to see, at a macro level, the number of goals set and achieved, the time it takes for users to achieve goals, and the types of goals people set (physical health, mental health, alcohol, smoking, housing, relationships, work and money). As users can also view their next appointment, and request to change the details, the app also helps to reduce the number of missed appointments – therefore saving the key worker time, and the organisation money. The app was rolled out as an initial pilot to our YouFirst service, a small Manchester service working with people at high risk of diabetes and also to our own staff. The pilot has just ended, and, alongside much positive feedback, staff and service users suggested some amendments and improvements, which are now being made. Among our key achievements is the issue of data control and ownership. We decided to make the app service agnostic, meaning that it can be used across all our services, and potentially by other organisations in the future. This means that, if a service user is engaged in more than one of our services, they still only need to have one version of the app and therefore one version of their goals visible to multiple keyworkers, if consent is given.